The annual Soul to Soul concert in Brooklyn will be hosting this year the full show of A Jewish Star Season 2 finale, with a cast of finalists, judges, Country Yossias host and star singer Benny Friedman. Voting for contestants for Season 2 of A Jewish Star Singing Competition, the online Jewish singing competition which has taken the Jewish music world by storm, will be ending on Friday, January 21 at 12:00 pm EST. 10 finalists will be chosen from 144 contestants from the worldwide talent competition and 3 will be chosen from the Jewish Star Junior competition. This year, each of the finalists chosen by online voters will be singing on stage in front of the judges and a live audience. The finale of A Jewish Star season two will be hosted by the annual Soul to Soul concert, benefitting the education of children with special needs. The show will take place on Sunday, February 20, 2011 at the Brooklyn School for Music & Theatre, 883 Classon Avenue, Brooklyn, New York. Renowned musician and producer Yochi Briskmanof Project Productions is joining the production team, headed annually byShmuly Goldmanand his wife Tzirl Goldman, directors of the Chasdei Soul to Soul organization. Also joining as co-executive producers are Yossi Sofferand his wife Mica Sofferof Unique Advertising Group and COLlive.com. The MC will be the beloved Country Yossi, renowned entertainer, Jewish radio host and singer. A special guest at the show will be singing sensation Benny Friedman, whose debut album Taamu is a worldwide hit. 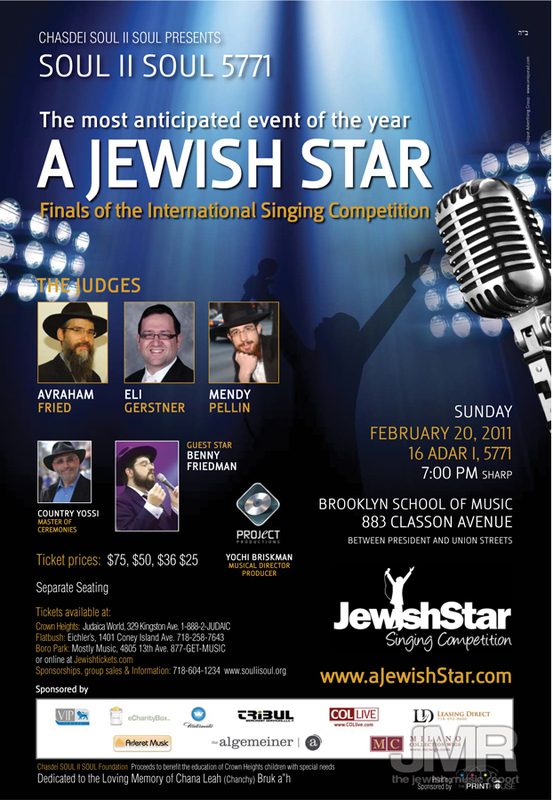 Finalists performing will be rated and narrowed down by the new judges panel: Jewish music superstar Avraham Fried, multi-talented producer and composer Eli Gerstnerand comic entertainer and actor Mendy Pellin. The show is sponsored by VIP Israel, E-Charity Box, Watermatic, Tribul Merchant Services, COLlive.com, Aderet Music, The Algemeiner, Milano Collection Wigs and Leasing Direct. As in years past, the concert will be separate seating only. Tickets will be sold at www.Jewishtickets.comand Mostly Music in Boro Park, Eichler’s in Flatbush and Judaica World in Crown Heights.